FRISCO, Texas (BRAIN) — Sometimes finding the right product requires sitting down and designing it yourself. Especially when that product is a comfortable yet high-performance bike saddle. CHATTANOOGA, Tenn. (BRAIN) — American Bicycle Group, the parent of the Quintana Roo, Litespeed, and Remot bike brands, has announced "a strategic alliance" with HED Cycling to co-develop a HED wheelset specific for Quintana Roo's disc brake bikes. BOULDER, Colo. (BRAIN) — Stromer's new ST3 promises speed, style, and efficiency — and silence. WATERLOO, Wis. (BRAIN) — Trek has announced a relaunch of its longest-standing unchanged product - the Bontrager Bat Cage, an injection-molded water bottle cage first introduced in 1997. The newest version is made from discarded and end-of-life fishing nets that could otherwise pollute the oceans. MONTEREY, Calif. (BRAIN) — 7mesh's new shorts and bib feature a new body fabric that the company said is noticeably more compressive without sacrificing moisture wicking, ventilation, or breathability. MONTEREY, Calif. (BRAIN) — E*thirteen's new XCX bring the brand to the gravel and cross-country markets. The company claims its XCX Race Cranks are the lightest production cranks on the market, and says its XCX Plus Cassettes offer the largest range in their class along with competitive pricing. MONTEREY, Calif. (BRAIN) — ZOIC, celebrating its 25th annicversary this year, is launched a new mountain bike short, the men's Ether One. MONTEREY, Calif. (BRAIN) — On the first day of Sea Otter, WTB will unveil two new aggressive TCS (Tubeless Compatible System) tires for enduro and gravity riding. BURNABY, British Columbia (BRAIN) — RaceFace's new Turbine SL wheelset features a welded 6069 alloy tubeless-ready rim with a 25mm internal width, laced to the brand's Vault hub. The company said the wheelset is suitable for XC or trail use. MINNEAPOLIS (BRAIN) — Otso's new Waheela C is a carbon version of its original, steel Waheela S.
COSTA MESA, Calif. (BRAIN) — MODe Sports Nutrition has introduced new, single serve Energy Blocks in a branded display box. Some quick hits from the Taipei Cycle show in Taiwan this week. MINNEAPOLIS (BRAIN) — Wolf Tooth Components' new B-RAD Strap Base is a versatile mount that allows riders to add a bottle cage to frame tubes, seatposts or other locations. It attaches with silicone-backed hook and loop straps. WASHINGTON (BRAIN) — Stromer is working with the U.S. Consumer Product Safety Commission to recall its ST5 e-bike because the stem can break, posing crash and injury hazards. Stromer has received one report of the stem breaking. No injuries have been reported. 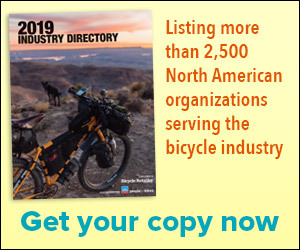 CYPRESS, Calif. (BRAIN) — Yamaha Motor Corp., USA, is now delivering its new adventure gravel e-bike, called the Wabash. The Wabash is a Class 1 e-bike designed and developed from frame to motor by Yamaha.